The 530U3C is the latest ultrabook from Samsung, aimed to provide a combination of portability and function to the end user. Crammed into it's tiny 1.5kg weight and 31.5cm by 21.8cm by 1.5 to 1.8cm depth is an incredible specification - 13.3" clear display, an Intel Core i5 3317U 1.70 GHz processor, 6GB RAM and 500GB hard drive, all based on Windows 8 Operating System. Keep reading for our Samsung 530U3C review. 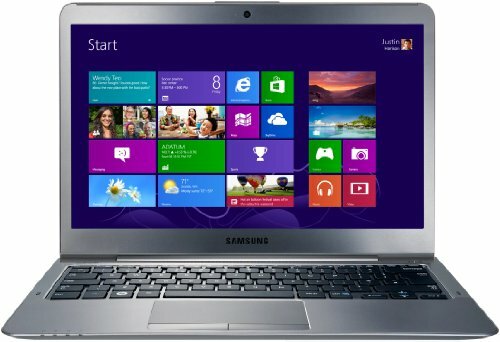 Below is our review of the Samsung 530U3C, a 13.3" laptop, featuring 6GB RAM, 500GB hard drive and Windows 8. Need a powerful but lightweight and small laptop so you have access to a computer whilst out and about? An ultrabook is probably the solution for you. Typically much thinner and lighter than the average laptop, they offer a great deal of computing power from with inside their tiny casing. There are however downsides to owning an ultrabook - they usually have smaller screens than the average 15.6" screen laptop, as well as costing a bit extra, and lacking certain features such as DVD drives, in order to keep the weight down. That said, if you have to regularly commute, then an ultrabook is an ideal solution. Samsung's latest offering to the ultrabook market place is the 530U3C - with a 13.3" screen and an overall weight of just 1.5kg. In terms of style, it features a beautiful silver exterior, which continues in a similar colour scheme into the inside of the notebook. The heart of this ultrabook is Intel's dual core i5 3317UM processor, which operates at a speed of 1.7GHz. This is backed up with a substantial 6GB of DDR3 RAM and an integrated graphics card. Overall this ultrabook performed well in our test, handling several applications loaded concurrently with ease. The display, although slightly smaller than the average 15.6" notebook, offered a decent crisp picture, with vivid colours and sharp graphics. The hard drive, spinning at 5400rpm, provides 500GB of storage, which should cater for the majority of laptop users. In terms of external connectivity, the 530U3C ultrabook is slightly restricted when compared to the average laptop - in order to keep the slim profile and the low weight, there has to be a slight compromise. This model features an Ethernet, USB 3.0, HDMI output, headphone and microphone combination, a 4-in-1 card reader (providing access for SD, SDHC, SDXC and MMC), VGA (via an adapter) and 2 USB 2.0 ports. Both the speakers and webcam offered pretty good performance - offering two 2W stereo speakers and a 1.3 megapixel camera respectively. The operating system booted up fast - provided by Microsoft, in the form of the latest incarnation of Windows - version 8. Finally, the two main input methods were perfectly functional - both the keyboard and touch pad were easy to use, and gained praise from our testers - and despite the relatively small overall dimensions, the offer consensus was that this ultrabook was pretty comfortable to work in front of. So what did we make of the 530U3C overall? Impressive specification, offering speedy computing whilst out and about. Due to size restrictions, no DVD drive - however this does help keep the weight down and prolong battery life. A highly portable and practical solution for those who like to carry their computer around with them. If this sounds like you, then you may well want to take a closer look at the Samsung 530U3C.